I will never forget that bitterly cold morning in Ta Xua when the sun rose together with a vast sea of fluffy clouds right in front of our eyes. Ta Xua – the floating sea of clouds! After half an hour of climbing amid the freezing cold of the mountainous area, we finally found what we had been hunting for. For a moment we all turned silent, hoping fervently that the awe-inspiring sight we were beholding would last longer. Heaven never felt closer to us! 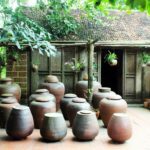 Since Ta Xua is quite a new destination for foreign travelers to Vietnam, I would like to share some of my experiences from our trip from Hanoi to Ta Xua in January 2016, including getting to Ta Xua from Hanoi, what to do around Ta Xua, accommodations in Ta Xua and the best tips for a successful cloud-hunting trip in Ta Xua. If you need any other guidance, please feel free to email me or subscribe to my mailing list. 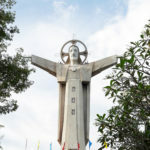 I’ll be very glad to introduce this awesome destination to all those looking for a unique travel experience in Vietnam. 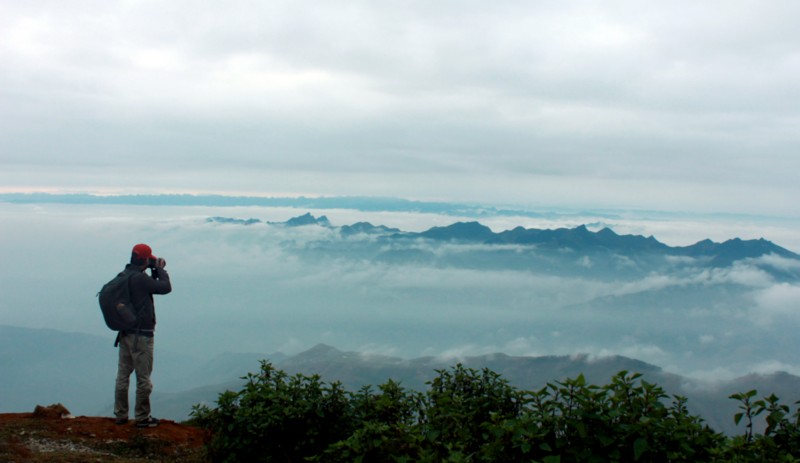 Ta Xua is a range of mountains in Bac Yen District of Son La Province, located in the north of Vietnam and around 240 km from Hanoi. 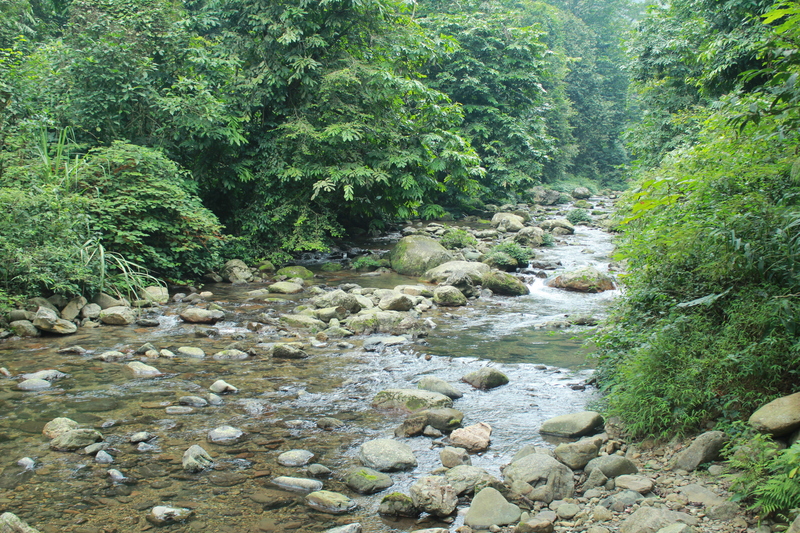 It forms a natural border between the two provinces Yen Bai and Son La. The highest mountain of Ta Xua is ranked the 10th highest mountain top in Vietnam, at the height of 2865 m. Its three main mountain tops form a line which looks like the rough back of a dinosaur. Hence the place is also called “dinosaur backbone”. Trekking here used to be a real challenge. However, the route to Ta Xua’s dinosaur backbone has become much more easily accessible recently, thanks to the construction of new routes leading quite close to one of the mountain tops. During our trip in January 2016, we only had to trek for around 2km. 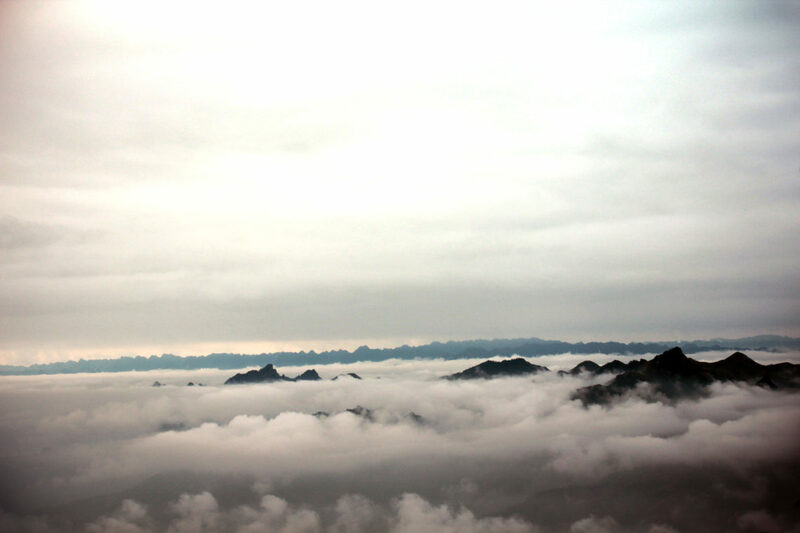 Ta Xua is mostly known for a special phenomenon around its mountains: the formation of thick clouds, making us visitors feel like we are standing right in Heaven. 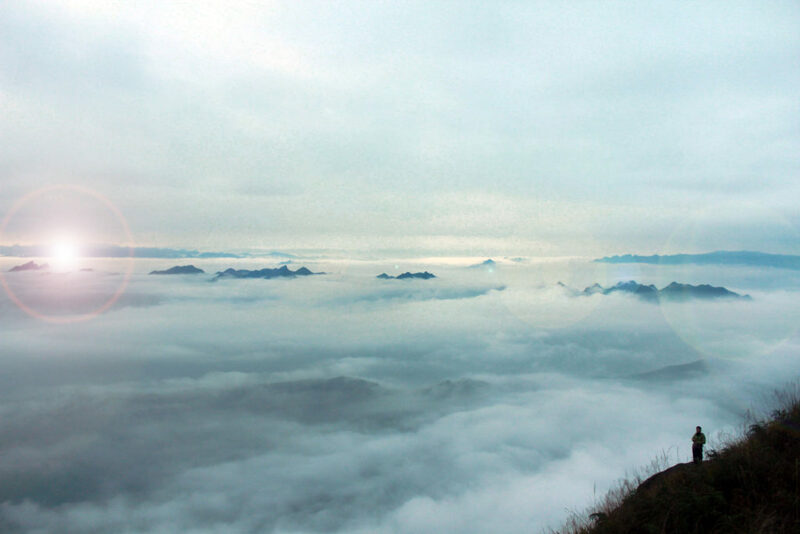 Since some travellers came across this place several years ago, Ta Xua Cloud Hunt trips have increased in popularity. 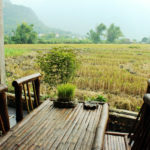 However, Ta Xua is fortunately still considered an off-the-beaten-track destination for foreign travellers to Vietnam. How to get to Ta Xua? If you’re confident with your motorbike-driving skill, you can rent a motorbike from Hanoi and ride here. From Hanoi, you can reach Ta Xua by first driving to Bac Yen (Son La Province). 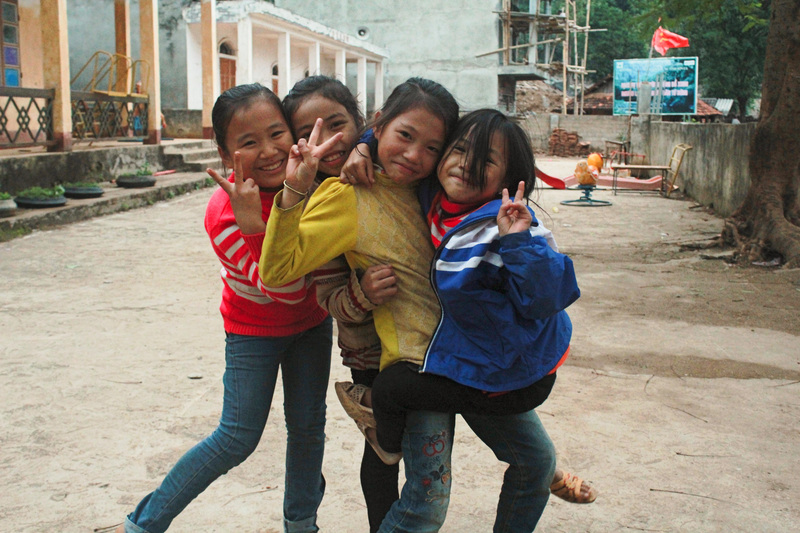 During our 2-day trip to Ta Xua last January, we chose to drive to Bac Yen from Hanoi. Then, we spent a night in bac Yen and departed to the mountains at 4.30am in the morning. 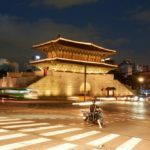 Another option is to go straight to Ta Xua on the first day.You can then set a camp somewhere on the way to the mountain top and enjoy the sunrise the next morning. Remember to bring your own food and drinks. Otherwise, take a public coach from Hanoi at Yen Nghia Coach Station to Phu Yen, then to Bac Yen (Son La Province). Then book a “xe om” (motorbike taxi) for a distance of around 15 km from Bac Yen to Ta Xua. A little trekking is required if you want to climb to higher mountain tops. Note that if you travel by coach, remember to check with the driver what time the return coach will depart from Bac Yen back to Hanoi. Sometimes there’s only one coach per day and you won’t want to miss it. Here is a list of coaches going from Bac Yen to Hanoi as found from this link. I have not verified these coach timings, so I’d strongly recommend you to call these transportation companies and double-check before your trip. (I doubt if they speak English so you might want to ask a Vietnamese to help speak to them). So we arrived in Bac Yen at around 3pm on a cold winter day in January. Greeting us was a local young man named Long who had been educated in Hanoi before. Long’s family seemed to be the richest in town, owning a café, a karaoke bar, a mini movie room and 2 restaurants in this mountainous district. And as you could guess, those were the main activities to do in Bac Yen while we waited until the next day to hunt clouds. Bac Yen was, until January 2016, still unaffected by any tourism initiative either by the government or by the locals. 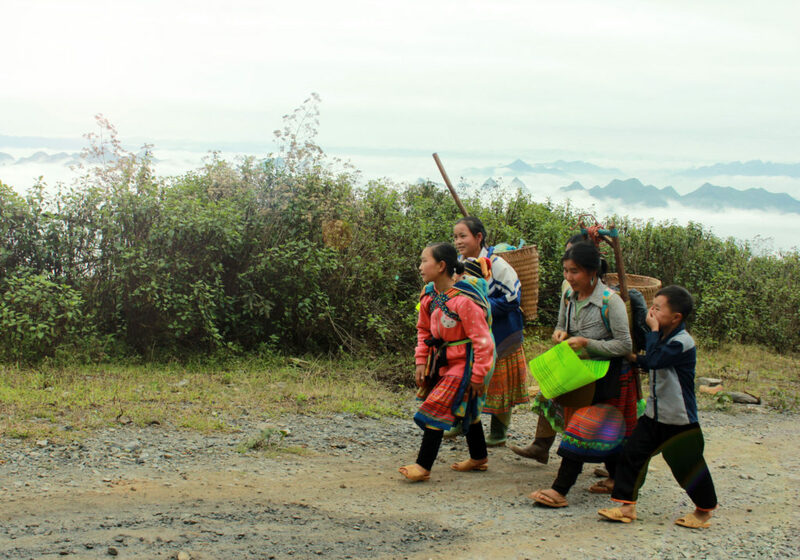 Visitors to Bac Yen were mostly small groups of young and adventurous Vietnamese travelers who spent a night there to prepare for their cloud-hunting trek the next day. Thanks to Long’s recommendation, we also found a more local-like activity to join: Hot bathtubs prepared by the H’mong. H’mong people are an ethnic minority living mainly in the mountainous regions in North Vietnam. There was a H’mong family who organized hot bathtubs mixed with local herbs for visitors with a small fee. The hot bath came to us as a real haven from the bitter cold outside. Tips: I have recently received feedback from a traveller who stayed at Cloud Paradise Hostel. According to her, meals there were overpriced and tasted terrible, as least to Westerners. To be honest, Ta Xua’s tourism in general has not fully developed, which means that dining options there are more limited than in other places. Therefore, if you’re worried about the local food here, it’s perhaps better to bring along some dry food from Hanoi. Our local guide Long, whom I mentioned above, owned a restaurant in Bac Yen called “Pho Nui”. I think the food there tasted okay though not extraordinary. It’s probably the best place to eat in Bac Yen though. 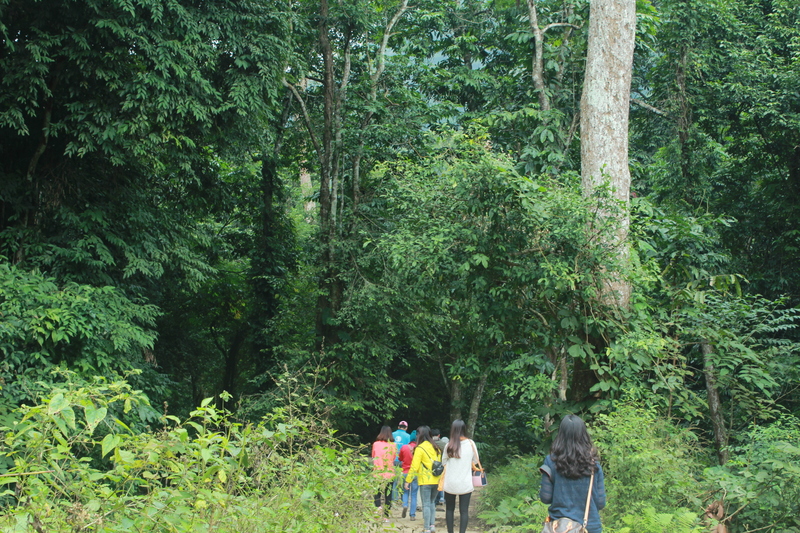 On the way from Hanoi to Ta Xua, you can drop by Xuan Son National Park in Phu Tho Province. Attractions in the park include a beautiful cave, an old bridge crossing a peaceful-flowing channel and many different types of local flora and fauna. The best time to go cloud hunting in Ta Xua is from December to March. This is when the probability of catching the sea of clouds is highest. In order to increase the probability of catching clouds, you should go cloud hunting in the early morning when the sun rises. Choose a day when temperatures are low at night and high during the day. Humidity on that day should be high while the weather is sunny. The whole trip can last for 2 days with one night spent either in Bac Yen or in Ta Xua. Another option is to visit Moc Chau – a beautiful city in Son La with flower festivals and tea hills. If Moc Chau is included in your itinerary, your trip will be expended to 3 days. It was quite fortunate for us not only to hunt clouds successfully, but also to welcome the year 2016 by beholding sunrise above this amazing sea of clouds (Our trip was made on the 1st of January, 2016). 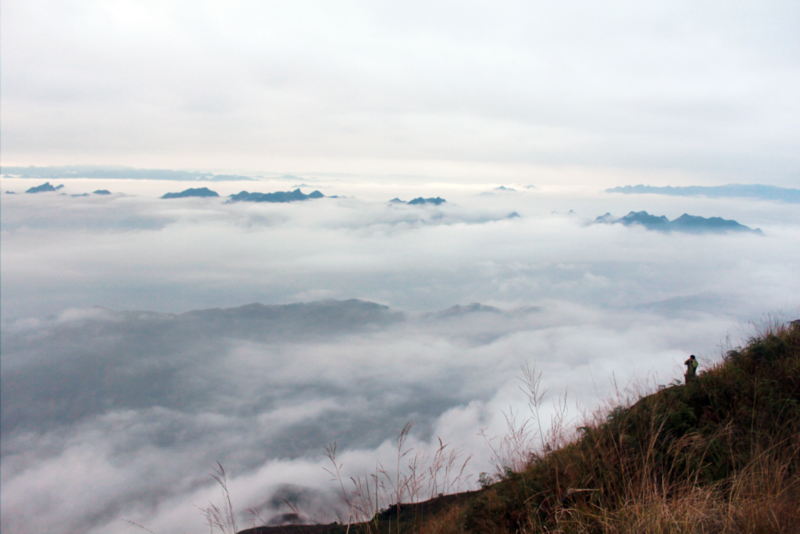 If you are looking for a unique travel experience during your trip to Vietnam, a journey to hunt clouds in Ta Xua is definitely what you should be after. Can’t believe I’d never heard of Ta Xua. It looks amazing! I love trekking so it would be a great destination for me. Especially love the part about cloud hunting. I’m going to echo other comments by saying I haven’t heard of Ta Xua either! I’ve been to Vietnam and just this morning my boyfriend and I were saying that 3 weeks really wasn’t enough and that we should go back. I’m putting this on my must-see list – thanks for sharing! That viewpoint looks fantastic. I love the view above the clouds. I may visit Vietnam in the new future so I may check it out. Thanks for the info. Are the clouds ‘inversions’? If so we have them here, you should also look out for Fog bows (cloud rainbows) too – they are so cool. I had never heard of this region before, I’d love to visit Vietnam. That view is to die for! There’s a similar area in the Philippines where I am from although I haven’t been there yet. Thanks for a detailed description of how to experience this on our own! The Ta Xua cloud hunt is a unique experience. I have had a similar experience but I’m not sure where, I think it was in Sri Lanka somewhere. I love how you showed us how to get here, by bus or by bike. I wouldn’t like to drive a bike in Hanoi but I guess it gets quieter once you get closer to Ta Xua. The tips on hotels and what to avoid are good too. Thanks for sharing. Oh wow, absolutely beautiful!! Last summer I hiked a volcano in Guatemala and the view was very much the same. I said then – and the same applies for Ta Xua – if I were to ever be involved with a movie that needed a scene shot “in Heaven”, I’d totally go there. Wow, I love your photos! There’s something utterly mesmerising about clouds. I’m hopefully going to Vietnam this year, so will be referencing this again. After reading your post I am quite annoyed with myself that I did not go to Ta Xua when I was in Hanoi. How did I miss that. You tips on how to get there is very useful. Sometimes I find that it is difficult to know how to get to places when looking it up on the internet. Your photo with the person stood on the hillside looking at the clouds is great. It gives a great sense of scale. Gee wieikllrs, that’s such a great post! I’ve never heard of cloud hunting, that sounds amazing. The photos are gorgeous. And a hot bath sounds pretty great, too. And what a way to welcome a new year. I’d like to go hiking and caving in the national park, too. I had never heard of Ta Xua before but it definitely on my list now! It looks so incredible and those views with the clouds are breathtaking! Thanks for sharing the tips on how to get there too – will bookmark this for our next trip! Wow! The place looks so beautiful. Totally my kinda place. I’d love to trek this terrain. I still haven’t been to Vietnam yet. Let’s see where future takes me! So this is definitely getting added to my bucket list! I’ve never heard of it before, but it seems like a photographer’s dream destination for sure. Thank you for all the tips, definitely going to save this for later! Those cloud formations look breathtaking. I learned about the H’mong in Laos last year. The train from Hanoi to HCMC has been on my bucket list for a while now. 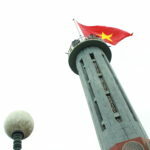 We have always wanted to experience Vietnam and I am glad to have read your post. We love a good hike and a hot tub and hunting clouds seem like a relaxing end to such an exciting adventure. Great post! This looks like a beautiful place, I would love to go there. Thanks for including so much information on the different ways to get there. It seems very accessible. Love the term Hunting clouds 🙂 I have had a similar experience of seeing sunrise over a sea of clouds while trekking in south India and I can very well relate to how heavenly it feels. The tips for finding the best clouds are quite helpful. These pictures look incredible! Thank you for the information! Those photos are beautiful! Lovely work! I am ashamed to say thay I have never heard of this place before. But it seems really great! Asia is still unknown for me but I want to go next on a cloud hunt! This place looks otherworldly! I’ve never been to Vietnam but will need to dd this to the list of places to visit – how long does it take to get there by bike/bus? Wow! Never heard of it either! And I’ve never done cloud hunting, haha. Looks awesome! This sounds like quite a fantastic adventure. I can’t believe I didn’t hear about Ta Xua when I was in Hanoi. It looks like I missed out quite a bit. I loved Vietnam and this gives me another reason to go back. Thanks for sharing your unique experience. 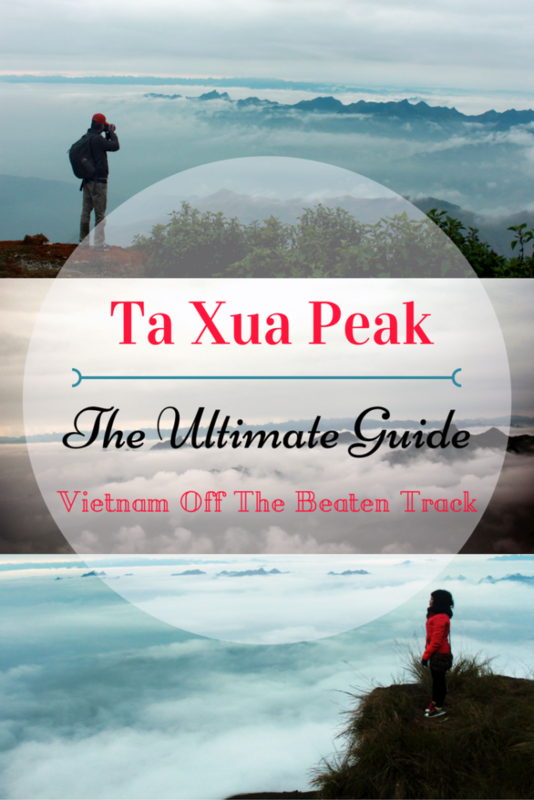 I travelled around Vietnam a few years ago but I have never heard of Ta Xua. I definitely feel like I have missed out as it looks awesome! Will definitely be making sure I go there when I go back to Vietnam. Vietnam has a lot of off the beaten path places like this. It looks really nice. I’ve never heard of Ta Xua. What a beautiful place and very magical with the layers of clouds. Thanks so much for sharing. Unreal is the only word I can describe Ta Xua, it’s an absolute hidden gem! Thanks for sharing! I’ve never actually heard of Ta Xua! But man! We are adding this place to our list when we travel throughout the whole of Vietnam in 2018, as this definitely looks like a hidden gem! Wow, those views were amazing! It’s so cool that you can see the clouds like that. I would love to get there someday! Magical landscapes… It surely is an unique experience… makes you feel like a bird! That looks so amazing! Im surprised Ive never heard of Ta Xua. Would be so magical to go cloud-hunting! Hey I’d love to ask you a few questions about how to get there and the camping! Would it be ok if I emailed you or something? I live in Hanoi and I’m levaing Vietnam in a few weeks. I want to go here soon! I found your article through the FTB Pinterest page, it’s lovely! Your pictures are really beautiful too! I’d never heard of this place before, it’s definitely on fmy list now for when I finally make it over to Vietnam. I’ve been doing the Laos/Thailand loop for like 4 years now, and a few spots in Cambodia, Indo, and Malaysia…but no Vietnam yet. Hopefully next year. It’s interesting to me that the best time to see the clouds is in high season. I would’ve thought the rainy season since there’s more moisture in the air. Is it just too much rain maybe? Hi! We’re currently in Bac Yen and planning to drive to Ta Xua tomorrow morning- the map stops before Hang Dong, I was wondering if you knew the way to get to the dinosaur spine where the road seems to stop? I think it’s too late for my reply to reach you now and I’m not the most knowledgeable person about routes around that area anyway 🙁 I hope you have managed to find the right way by asking the locals. Ahhh, so sorry for the late reply! I don’t remember the name of that place with the hot tub anyway, but you can always stay at another place and come there just for the hot tub service. Hope you had a nice trip to Ta Xua! We can trekking on top by ourselves or have to hire trekking guide. Hi prateep, it’s better to have a guide if you are not familiar with the area I think 🙂 If you want to trek there by yourself, remember to check the map carefully and confirm the route with the locals before you start. Hi Fiona. How likely are we to see the clouds if we go in early July? Unfortunately, we are only in Hanoi for the end of June and July, but we would love to go to Ta Xua. Hi Anjali, it’s quite unlikely to see the clouds in Ta Xua during the summer, as the temperature is higher and heavy rains come more often. Even if you do see it, the ocean of clouds does not last as long as it does in the winter time.